LP0233. 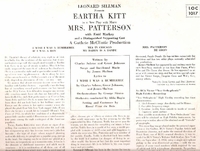 MRS. PATTERSON, Original 1954 Cast, w.Eartha Kitt, Ruth Attaway, Alonzo Bosan, Terry Carter, Helen Dowdy, Enid Markey. RCA Shaded Dog black RCA LOC-1017. “Eartha Mae Kitt was an American actress, singer, cabaret star, dancer, stand-up comedian, activist and voice artist, known for her highly distinctive singing style and her 1953 recordings of ‘C'est Si Bon’ and the enduring Christmas novelty smash ‘Santa Baby’, which were both US Top 10 hits. She starred in 1967 as Catwoman, in the third and final season of the television series BATMAN. Orson Welles once called her the ‘most exciting woman in the world’. Kitt began her career as a member of the Katherine Dunham Company in 1943 and remained a member of the troupe until 1948. She appeared in the 1945 original Broadway production of the musical CARIB SONG. In 1968, her career in America suffered after she made anti-war statements at a White House luncheon. Ten years later, she made a successful return to Broadway in the 1978 original production of the musical TIMBUKTU!, for which she received the first of her two Tony Award nominations. Her second was for the 2000 original production of the musical THE WILD PARTY. A talented singer with a distinctive voice, she recorded the hits ‘Let's Do It’, ‘Monotonous’, ‘Mink, Schmink’, ‘Under the Bridges of Paris’ and her most recognizable hit ‘Santa Baby’, which was released in 1953. Kitt's unique style was enhanced as she became fluent in French during her years performing in Europe. She spoke four languages and sang in seven, which she effortlessly demonstrated in many of the live recordings of her cabaret performances. In 1950, Orson Welles gave Kitt her first starring role as Helen of Troy in his staging of DR. FAUSTUS. A few years later, she was cast in the revue NEW FACES OF 1952, introducing ‘Monotonous’ and ‘Bal, Petit Bal’, two songs with which she is still identified. In 1954, 20th Century Fox filmed a version of the revue entitled NEW FACES. Her other films in the 1950s included MARK OF THE HAWK (1957), ST. LOUIS BLUES (1958) and ANNA LUCASTA (1959).